In 1984 the National Association of Episcopal Schools (NAES) hosted their annual meeting in Port-au-Prince, Haiti. During their visit many U.S. delegates became very concerned about the overall condition of the Episcopal schools in Haiti. At that time the Haiti Episcopal Schools Partnership was born when a number of U.S. delegates agreed to sponsor a school in Haiti by pledging financial support for programs and infrastructure. Through this program North American Episcopal Schools are matched with Haitian Episcopal Schools, many which serve students in remote and poor areas. In the late 1990s both National Cathedral School in Washington, D.C., and St. Matthew’s Parish School in Pacific Palisades, California, were part of a U.S. group that helped build St. Paul’s School in the village of Caracol located in the “Centre” region of Haiti. 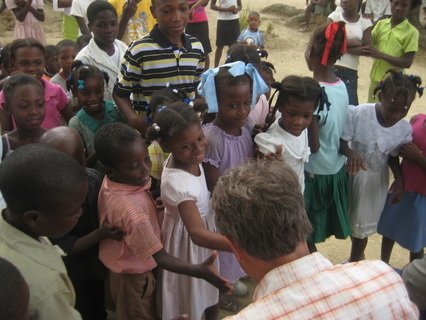 Following the January 12, 2010, earthquake in Haiti, the NAES Partnership Program became a much needed support to the Haitian Episcopal Schools, many of which also served as sites for medical, food, and water assistance within the wider community. St. Matthew’s and the National Cathedral School were reconnected as U.S. partners in support of St. Paul’s School in Caracol. Although our partner school was not affected, the result of the earthquake was a greater demand for the already limited resources. Refugees from Port-au-Prince returned to the countryside where they needed food and shelter. The first place they turned was the churches and the schools. Over 60 Episcopal schools and parishes in the United States have established a partnership with an Episcopal school in Haiti through the Partnership Program of the Episcopal Diocese of Haiti. Within the Episcopal Diocese of Los Angeles, partnerships have been established at Campbell Hall (Studio City), the Gooden School (Sierra Madre), St. James (Los Angeles) St. Mark’s (Altadena), St. Mark’s (Downey), St. Mark’s (Glendale), St. Mark’s (Upland), and St. Matthew’s Parish School (Pacific Palisades). Our U.S. liaison to the Partnership Program is Serena Beeks (former Head of St. Mark’s School in Upland, CA, and current Executive Director of the Commission on Schools in the Episcopal Diocese of Los Angeles). According to NAES, "over 250 Episcopal schools in Haiti provide quality education to children of all faiths and remain an anchor of stability and progress in the communities they serve. Many schools were damaged and destroyed during the January 2010 earthquake and remain in need of rebuilding. Others have needs for, among other things, teacher salaries, student tuition, building improvements and expansions, basic supplies, and feeding programs. The schools are seeking long-term cultural and prayerful relationships and financial support through the Partnership Program."